To give a little background information, I love the ToG series but never really liked Chaol or Nesryn to be honest. Chaol’s character really bothered me and I hated him for most of the series (whoops), so I wasn’t rushing to pick this book up like I did with every other instalment. The only reason I picked this book up when I did, was because I want to read Kingdom of Ash when it comes out in October. Sarah’s writing style can be very descriptive at times, but I also found myself skimming a little bit whenever the descriptions were a bit too long. I began the book in the evening, read until I was falling asleep (around 4am I think), and then continued as soon as I woke up. The storyline drew me in, but at times I felt like some scenes and sub-plots really dragged on, but other scenes were way too quick and I felt like I needed to re-read parts. I don’t think the book necessarily needed to be 650+ pages, and the same story probably would’ve worked in a 500ish (or less) page book. Regardless, I enjoyed the story. Regarding characters, I was pleasantly surprised to find that Chaol and Nesryn were a lot more likeable in this book! Chaol’s character was explored a lot more and developed further. I enjoyed reading his chapters, and seeing things from his point of view. Nesryn was also explored a lot further, and I enjoyed that. I liked the interactions with the other characters, and I loved Yrene from the get go. ALSO guys, the ships in this book?? SAILED. 1000% here for them. There’s quite a bit more representation and diversity in this book, most of the characters are of colour, there’s a LGBTQ+ couple and of course, the main protagonist has a disability. While I don’t have any experience with disability, I know Sarah did a lot of research and put in a lot of care to make sure Chaol was a realistic character. In saying that, I felt like Chaol’s thoughts and feelings were well-represented. I could understand and sympathise with the emotional distress he battled with, and it felt raw and real. I wouldn’t recommend skipping over this book if you’re reading the series, even if you don’t like Chaol. Even though it was slightly long, I loved how the book turned out in the end and I’m so excited for the story to continue in Kingdom of Ash! 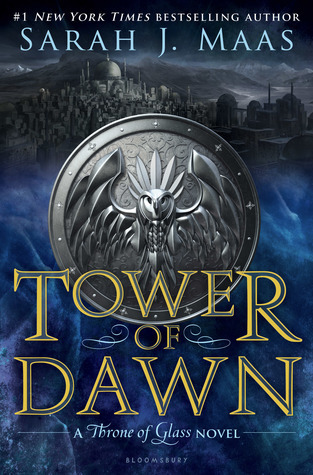 I’m listening to this on audio and I liked Chaol in the Throne of Glass series but TBH, Tower of Dawn doesn’t feel or sound like the ToG books, and I am pretty bummed about it. I am just not a big fan of Sara J.Maas’ other works(ACOTAR etc. ), but I LOVE(D) ToG soya. That’s a good point! It’s been a while since I read a ToG book so it still felt similar, how far into the story are you?